I found this picture on a mag ages ago and forgot to scan it, till I found it here (thanks Dustjacket attic!). I don't know who she is but here is a tip: any Harry Potter fans out there would have recognized her straight away. Hi everyone, I am excited to say that The Black Wardrobe has just over 300fans on Facebook and 140fans on this blog!!! I am so excited and a thank you is not enough for your consideration and taking your time in reading my silly posts. SO, I am conducting a giveaway, open to everyone, in both my facebook and this blog page. 1-You must be a follower of both my facebook and blog. 2-You must post a comment explaining why or what you like about The Black Wardrobe. You can post it either here on the facebook page. Please, remember to include your email address too, so I know who you are! This giveaway will be open till the 15th of August. Good luck! Hi everyone, just to let you all know that I just started a sale on my website. 10% OFF on purchases made between today and the 15th of August. If you have eyeing that glorious dress or maybe tempted to get one of the bug brooches, don't hesitate and take this chance to grab yourself one! 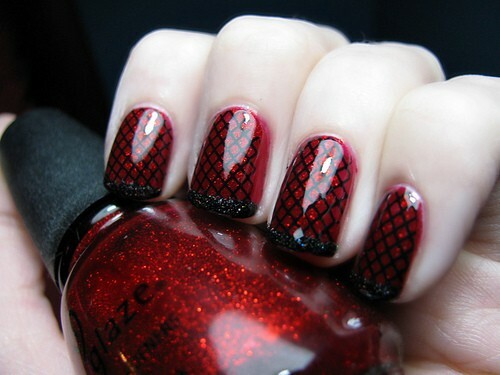 I never liked this opulent over the top nails you see everyday now. BUT, look at these! Who could resist that deep red colour?, with embellishments in black!! Gorgeous. If anyone knows what brand this is, please, let me know.